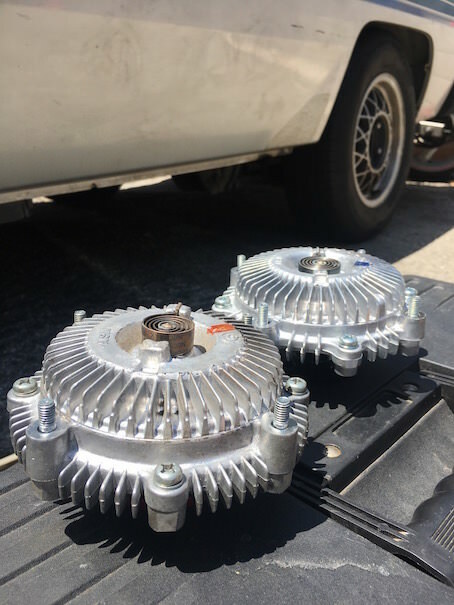 Do you need a special wrench (and or any special tools) to remove the fan clutch on these vans? I think mine needs replacing. Ordinary tool sets probably won't reach it, but, the guy across the street is a Honda mechanic and had 2 really old box-end wrenches that were super long and thin... both were 6-point 10mm wrenches with only a one-sided wrench and just a long shaft on the other end ... about 12" long... the "Honda" brand wrench was close but no cigar, and the "Snap-On" brand wrench had more offset and just barely worked. With it I was able to pull the clutch and fan off the water pump without moving anything else at all. It would be worth buying one long wrench if you can't borrow. The 4 nuts were already a bit rounded from some previous butcher, but, you can reuse the fan-attaching nuts for the "clutch-to-water pump" studs and buy new flanged nuts for the "fan-to-clutch" studs. I was able to wiggle the clutch and fan as one piece in and out of the bottom of my 2wd van... which now makes me wonder if my entire shroud is still in place. Last edited by llamavan; 11-02-2018 at 04:05 PM. This message has been deleted by bushcat. If anyone has a cool home made shroud-bottom can you post a photo and a "how-to" ? Thanks TanVan. Looks like the autoparts store rents fan clutch wrenches. Do people usually replace the water pump when down there? This message has been deleted by llamavan. Re: Is my brand new fan clutch a dud? HISTORY — Just finished fixing all culprit issues associated with overheat, fan clutch, belts, water pump, radi cap, thermostat, hoses. Runs just fine and behaves normally EXCEPT ...In traffic or other warm-running situations, the gauge creeps. In Los Angeles, this is going to be a double-whammy issue as spring/summer approaches, so I want to figure it out right now. My fan clutch very audibly is engaged after a cold start, so I know it CAN work, the thing is, after the temperature gauge gets past half, I never hear it again and a quick test right after I shut it off gives no resistance. Soooo, is it possible that the clutch in there is just a dud? Could I have done something dumb or wrong? is not enough hot air getting to the bimetal tstat? (radiator clogged up?) It's a brand new (less than 500 miles) Aisin clutch from RockAuto. HISTORY, PART TWO -- I was sitting in low speed traffic, and the thing did come on right after the temp gauge hit halfway --- hmmm. It's worth noting that it's never overheated, but it's gotten too close for my comfort on several occasions, usually at around 25 mph on a congested freeway. Before I did the work, the temp gauge would live at 1/4 of the way up (presumably from a stuck open thermostat.) Any thoughts? Am I just being scared over nothing? My next step is to blast the front of the clutch with a heat gun and see if the bimetal moves predictably. 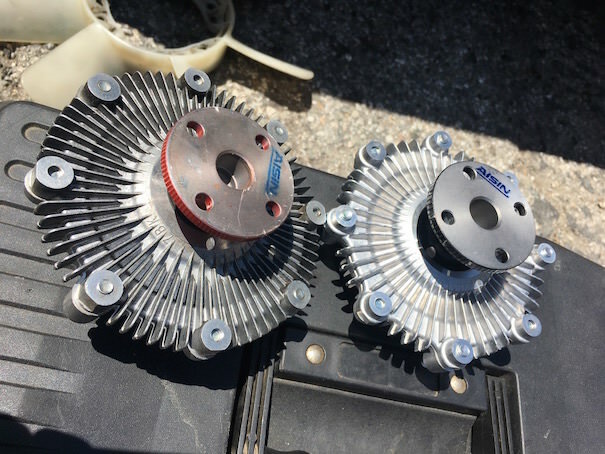 RESOLUTION — I did learn a bit about fan clutches and, at least in my case, the Aisin FCT-37 I had (with the red mount) never worked in my 2WD auto application. I discovered this after being (again) hyper sensitive about the van cooling, and noticed that no matter the situation, the red back clutch never activated unless it was a cold start situation, when the oil viscosity locked it on regardless. While idly online shopping, I saw that there was another AISIN clutch fan listed as fitting the van, the FCT-19, which has a black mount and seemed slightly smaller. I did some research and saw that it was listed as stock for the very early (2.0, likely) motors At the time, it was somehow listed on amazon for $15 (whoa!!) so I grabbed one just to experiment. After days and days of garbage heat and me relying on the A/C, the new clutch fan works exactly as it should. It comes on post freeway drives, in stop and go, and when heat from the condenser gets to it. The FCT-19 is definitely physically smaller and less heavy duty (see side by sides below) but it works perfectly, so it's a keeper for me. Has anyone else had this experience, used both, or did I really just end up with a weirdly defective AISIN product? It seems highly unlikely, but I can't explain it otherwise. I opened it up and drained about 5 or 6 cc's of the silicone fluid out of it and tried again. The new (RED) Aisin clutch just had too much fluid in it from the factory. I got lucky with my estimated quantity to drain because, now, the clutch fully engages only at startup -- it stops howling after about 15 or 20 seconds -- and, most importantly, I clearly heard it re-engaging this summer during really hot drives (high 90's and high humidity--freeway + street)! This saved me from the "crap-shoot" of exchanging it and trying a 3rd new clutch all within 4 months. (and, for reference, the van cooling system has no negative issues of any kind... and the front and rear heat also both work splendidly ---- the original clutch was always "locked on" which is why it was replaced ... and I expected the new aisin clutch to "fade out" after startup like it's supposed to, and it almost never did...and the replacement they sent was even worse... so, I saw the "silicone fluid tweaking" on a 4-runner site ---- and it worked.). Use Toyota #90916-03046 180° F T-stat. The gasket you need is #16325-63010.
is Aisin OEM Toyota? or is Aisin aftermarket? ordering a few things from rock auto, but am confused on what's aftermarket or not. is toyota OEM only available from toyota? getting the aisin fan clutch and figured it'd be a good idea to replace some things that haven't been done while I have the chance to. (i have very limited mechanic experience.. which is probably obvious haha) should i replace the coolant hoses or anything else just for good measure or inspect them first? or since the fan clutch is confirmed not working, should i do that first and then see where my temp gauge is at before replacing anything else? i don't really have time to waste as this is already effing up my plans, but I want to be thorough so i'm not having ANY overheating issues since I'm heading to the south. Toyota buys parts from several outside manufacturers. Denso and Aisin are two of the big ones. Denso and Aisin make parts for other manufacturers as well (not exclusive to Toyota). In many cases, when you purchase parts from Toyota, The only difference is you'll get a red box that says "Toyota" AND you'll likely pay much more $$$. For this reason, whenever I can purchase OE equivalent parts at discount prices that's what I'll do. In the case of this clutch fan, Aisin was the original supplier to Toyota, so Aisin/Toyota are essentially the same. 87 LE in full "restormodif" mode... ... All Toyota with a twist or two! 89 4WD cargo in need of a little reshaping. as this is already effing up my plans,. "perfection is achieved, not when there is nothing more to add, but when there is nothing left to take away." A. de St Exupery.